Two puppeteers in Madrid, Spain, are being charged with “glorifying terrorism” and have become the center of a heated debate on the state of free expression in the country. 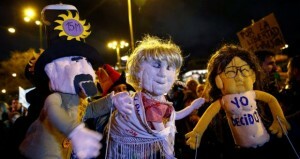 When Alfonso Lazaro de la Fuente and Raul Garcia Perez, puppet masters of the Puppets from Below theater group, put on their show “The Witch and Don Cristobal: Everyone Gets Their Comeuppance” as part of Madrid’s carnival celebration earlier this month, they probably didn’t expect to be arrested for supporting terrorism. The play, which was commissioned by the city of Madrid and Mayor Manuela Carmena, featured scenes of a nun’s murder, the hanging of a judge, and the beating of police officers. But it was a sign held by one of the glove puppets that read “Gora Alka ETA” that led to a national scandal on two fronts — a police investigation of the two puppeteers and their possible support of the terrorist group ETA, as well as a heated protest by Madrid citizens on the violation of the puppeteers’ right to free expression. A play on words, “Gora Alka ETA” roughly translates to “Long Live al-Queda ETA,” directly referencing the terrorist organization responsible for the murders of more than 800 people in Spain. When “The Witch and Don Cristobal” debuted at carnival, parents of children watching the show were shocked by what appeared to be a call of support for the group and notified officials. The two puppet masters were detained for five days in Madrid’s Soto del Real prison. Although Lazaro and Garcia both deny the charges and have been released from prison after the courts determined that they weren’t flight risks, protestors have taken to the streets defending the puppeteers’ right to express themselves. Flooding social media with the hashtags #JeSuisTitiritero and #LibertadTitiriteros, free speech advocates are calling for the charges to be dropped. “A piece of theatre, however inappropriate its content may appear, is not a security risk,” said Amnesty International’s head of the Spanish Branch Esteban Beltrán. “It is ridiculous that in a democratic country someone could be in jail for a piece of theater,” noted Pablo Iglesias, leader of the anti-austerity Podemos party, in a conversation with Cadena Ser radio. Though the situation as a whole has become a convoluted political mess, at the center of it all remain two individuals who were exercising their right to free expression. As Lazaro and Garcia’s lawyer reminded the courts, the show “must be interpreted as an exercise in humour, which can be provocative or hurtful.” It’s hardly an endorsement of terrorism.